If you're not confident to do this, try popping an informal note through their door. You can follow this up with a more formal letter saying that you will consider reporting them. We have put together an informal note and formal letter here which might help. In most cases, problem barking is caused by either neglect or, more commonly, because of insufficient training, so if you keep a dog yourself, be sure that it is trained properly in order not to become a nuisance. There is plenty of advice on the internet to help you with that, or you could get your dog enrolled in proper training and obedience classes. Dangerous as Well as Noisy? If you think your or your neighbours' dogs may be a danger to those in the vicinity, take a look at the 'Dangerous Dogs' feature. I live with a dog, it's my partners doberman dog and is a bone of contention as it howls each time we go out. It also whines when my partner leaves on and off all day, It has separation anxiety but he says it's only been a problem now she's old, 11yrs. It's a right pain as I love silence, and when the baby goes sleep if the dog starts whining I have to put the dog in the garage which i feel bad about. I actually dislike the dog a lot, I find her awfully smelly even after a wash, and she sits and licks herself it's gross. Anyhow no one has complained but i actually wish they would so I didn't have to be doggy day care and spend my life trying to keep her quiet or not going out so she doesnt annoy people, please someone complain as my partner doesn't think she's a pain at all!! Shes his precious doggy that does no wrong, but shes awful. There's little point in speaking to a barking dog owner.You're dealing with one of the most selfish types of people on the planet, and the barking will most probably increase, as the owner will take it personally. No one tells his/her sweet little poodle pumpkins, that it can't bark like it's got rabies, as you and your kids are trying to sleep. Send polite, but firm anonymous letters. This is perfectly legal, as long as it's not threatening.Outline the legal action you'll be taking, if the barking continues. A few comments here from dog owners, who appear to be offended that there barking dog is disturbing other people. Have some basic consideration for other people.Others need to work and sleep.Children need to go to school in the morning.How would you like it if a neighbor blasted out music constantly, and your child failed his/her exams?You wouldn't like it. Stop acting high and mighty because your little poodle pumpkins has the divine right to bark, and act like civilized human beings. My NEIBOURS dogs barck constantly when they leave the house, I've spoke to them a few times and they just look at me like I'mdaft I'm ready to explode, inconsiderate pigs . My neighbour’s Westie wakes me up,almost every morning from 5.45 onwards, barking in their garden. The Council will not act. It was 6.20 this morning, and I am at my wits end. It is completely and utterly selfish. Take the dog for a walk! The connent from tired about council prosecuted them for conplaining shows what a joke the council are. If it was happening to them im sure the rules would be different.like most councils houseing assoations ect the rule only stand when it suits them . Scummy neiubour for allowing dog to bark like that . Dogs belong in the countryside in a kennel on a farm. Cities and towns are no place for dogs. This article makes it seem like you can get in real trouble for having a barking dog, the truth is you can't and dog owners (like myself) know this. In the end it's a civil matter and no "punishments" can be enforced. The Statutory Notice is not worth the paper it is written on because unless the environmental officer is willing to camp out at your neighbours house for 21 days it can't be proven if the issue has been solved or not and it becomes your word against the neighbour. I had an issue with one of my dog who was very poorly treated by his previous owners which makes him very nervous and bark at basically anything. My neighbour went straight to Environmental Health without speaking to me and in the end I was INVITED to court and I declined to attend, got a Statutory Notice, did nothing and when the environmental officer turned up about 2 months later I told him my dogs barking was improved and he left (i did nothing ). Eventually the police became Involved and they basically told me there is nothing they can do. Although I did get my neighbour a serious taking to for pointing a CCTV camera at my living room window where my 7yo daughter plays. I have a neighbour who's dog barks loudly on and off all day. The owners are on benefits and don't work. We have complained to the council numerous times in the past 2 or 3 years but get nowhere. We obviously spoke to the owners first and then contacted the council. The dog barks until gone 10pm and is allowed to roam in the garden during the night, barking at 3am and 5am and 6am, this because the owners are I'll and don't sleep.much. I haven't seen the dog out of the garden for over 2 years and am concerned what will happen if it got loose. The RSPCA can't do anything and the council are totally not interested, in fact we were told last time we spoke to them that we could be prosecuted for complaining under some harassmentpolicy. Myself and my partner are full time employees and out of the house from 7am to 6pm most days in the week. We can't have our doors and windows open and we can even here the dog with everything closed. My partner is so stressed that she doesn't want to come home half the time and we are being forced to leave our home of over 30 years. Is there anything we can do or anyone we can see to help us.? It appears dog owners attitudes towards complaints of their dogs barking shows lack of respect for their neighbors and training clearly is non-existent. They think it's fine for their dogs to bark day and night and it requires more than one person to complain before they would even consider it a problem......not true if it affects just one person it's a problem FULL STOP. Where they are aware of issues, you become the problem not their dog/s. I have had dogs all my life and never allow my dogs to bark outside it's called a nuisance. Dog owners take responsibility for your dogs behavior they are your problem not every elses. Can i ask what a council would say is a unreasonable amount of time for my dog to be barking between the hours of 8am and 8pm, he never barks after 10pm or before 7am. I read these comments and think why.why why. Do people have dogs and go to work leaving the dog alone... Dogs are social animals and NEED company all day everyday. I have had several dogs and none of them barked incessantly all day. People think they love thier dogs but they do not. Being ignored and left on thier own all day is torture for dogs. I have had an anonymous letter posted through my door from a neighbour. They have said my do barks all day every day. I find this very hard to believe as she never ever barks when I am home. She may bark whilst I am at work but my husband pops in and out throughout the day to let her in the garden feed her give her attention and extra walks. She is walked twice daily I don't shut her in the garden. Now we have only been in our property 3 weeks, it's a new environment with a lot of new noises as we previously lived in a quieter area. O leave a radio on when I am out. I don't know what else I can do to prevent her barking when I'm not home. I am very worried as the letter was very insulting and accusing me of being irresponsible pet owner which could not be further from the truth. Any advice? Hopefully your dog will soon settle. The council will not usually act on anonymous letters so if this person does choose to identify themselves and complain to the council, at least you will know who it is then. For now, it's probably best not to do much about the letter. It's worthwhile talking to any immediate neighbours, let them know about the dog and how its settling in to the new environment and ask them to let you know you if it barks excessively while you're out. Hi I have a neighbour whom I've had to report to the police for harrassment that began 3 years ago and continues in a snidey and low key way when she and her family think there's no-one listening. Today she had got her new boyfriend to write to threaten me with legal action and an injunction if my 2 little rescue terriers keep barking. I think this woman made an anonymous call to Env Health this time last year as a revenge thing and I invited them to bring in their noise meters. They didn't proceed. I think I will have to get legal advice about that letter. 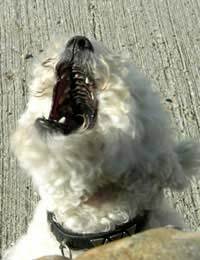 My dogs' barking is mainly reactive to the big dogs on the other sidebarking and whining at the fence can start mine off. Those owners will not call their dogs in, nor will they accept responsibility for their dogs' racket. The owners are both very hostile. If I know their dogs are outside I try to keep mine indoors or get them in quickly. I bring them in straight away if they start barking. I do this as quickly as I can, being elderly and a stroke survivor/disabled I'm not a sprinter these days. But I'm never far away from the patio door or the side door, where I've had a secure run built for them. I never leave these dogs alone unless absolutely necessary and never, ever for any length of time. I had a conversation earlier with the dog neighbour to advise her about the potential problem, she immediately blamed my dogs even though we've been indoors all day and hers have barked all afternoon, to the extent that I had to repeat twice what I was attempting to tell her. So my good intentions didn't end well and I guess there's no retrieving that situation. I'm at my wits end here. And very anxious. Any suggestions or advice will be welcomed. Thank you. Can anyone offer any help or advice please? I have 2 dogs a small terrier & a boxer. They are both very well looked after and our dogs are loved dearly as part of our family. They are walked regularly and we are blessed with a huge a garden too so they also spend a lot of time outside. Our neighbours have a lot of visitors to their home & unfortunately our dogs bark when anyone walks up their drive to visit them. I bring the dogs in as soon as they start to bark and become a nuisance. Ive also made changes to the garden adding extra fencing to keep the dogs away from them. Unfortunately my neighbours are still quote cross and I'm genuinely at a loss as to what else I can do. The latest confrontationended with my neighbour telling me to shutup and get rid of the dog. I have never been rude or aggressive to my neighbours and genuinely want to make things better. Any suggestions? Good to hear positive experiences of how the system's supposed to work. Thanks for sharing. I have the opposite problem my neighbour has complained and so I've put up recordings and the dogs are not barking. This could be because we have had to replace fencing, found his decking was a foot over into our garden, then complained because his kid was using our new fence as football goals. My concern is one of our dogs is a staff and you always hear of how staffs are mistaken for pit bulls. I'm so worried about it that I'm not sleeping now. Who has the neighbour complained to? Talk to environmental health, say you are aware that a neighbour has complained but you feel it's unfounded and explain the times of day and duration of your dog's barking. I have the opposite problem my neighbour has complained and so I've put up recordings and the dogs are not barking.This could be because we have had to replace fencing, found his decking was a foot over into our garden, then complained because his kid was using our new fence as football goals.My concern is one of our dogs is a staff and you always hear of how staffs are mistaken for pit bulls. I'm so worried about it that I'm not sleeping now.